The trade in wild birds is to be permanently banned across the European Union starting in July, EU animal health officials have decided. The move will replace a temporary ban imposed by Brussels in 2005 as part of measures to prevent outbreaks of the deadly H5N1 strain of bird flu. Animal welfare campaigners say the permanent ban will save millions of birds, including many rare species. 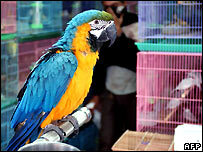 Only captive-bred birds from approved countries will be allowed into the EU. Tighter controls on the health and quarantine of imported birds are also to be imposed. Campaigners have blamed Europe's trade in wild birds as a significant factor in the decline of many threatened species such as the African grey parrot. Before the temporary ban was imposed, about 1.7 million wild birds were imported annually into the EU. About 60% of the birds caught for import died before they reached Europe from poor handling or disease, Britain's Royal Society for the Protection of Birds said. The temporary ban was imposed in October 2005 after wild birds at a quarantine station in Britain were found to have avian flu.